Well, cabin camping... it's much more comfortable that way! We still love getting out there where the phones and computers don't work, but trying to live in a tent while in our second trimester with twins just doesn't work. So we roughed it in style at the Pete Blodgett Cabin up in the Dartmouth Second College Grant. These cabins in the grant - this is the second cabin we've stayed it - are set in an idyllic northern New Hampshire woods (look up Errol, NH... then go north of there!) that are virtually untravelled, as the road is closed off by a gate. At four hours from Boston, this is the perfect getaway for us. 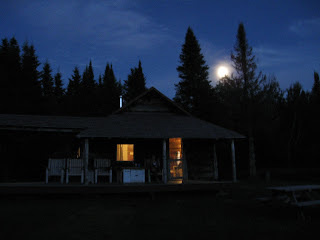 The cabins have running water piped from nearby streams, propane stoves and propane-powered refrigerator/freezers, and wood stoves - although we didn't need them because it was warm enough! All the comforts of home! 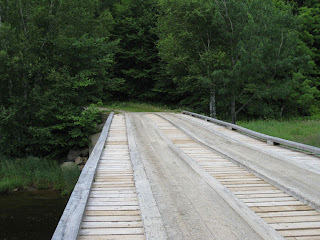 We plan on bringing the twins up here for years to come, to fish the native trout streams, hike the trails to the many peaks, and unwind from twin city life - which can be very trying. We fly fished - and Stacey caught her first Brook Trout on the fly! Stacey's keeper trout... that we didn't keep. All fish were released safely! 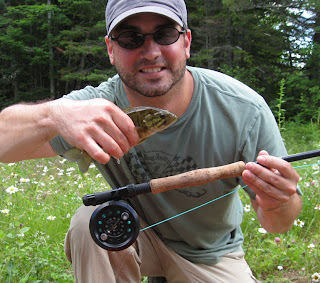 Mike even caught a smallmouth bass on the fly. 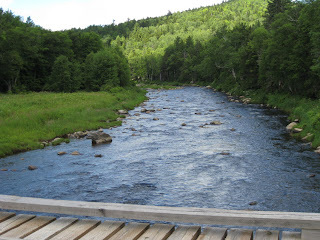 The smallmouth bass are starting to make their way up the river and some NH Fish and Game people were working nearby, catching and tagging the bass to study their migratory habits. We got this guy safely in a bucket of water and brought it over to that crew to be tagged and released. 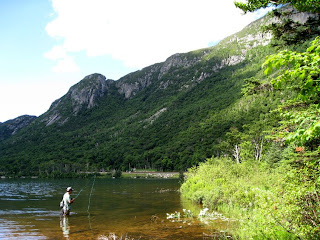 Fishing Profile Lake in Franconia Notch on our way back to Boston. This looks beautiful!! The twins will love it. You have inspired me - time to pack up the dogs and hit the road.